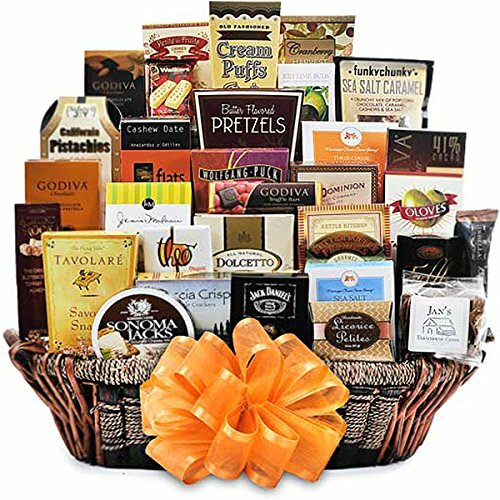 Our Ritz Gourmet collection basket is filled to the brim with the most sought after products that we offer. It begins with an array of gourmet crackers, starting with Jan's Farmhouse crackers from Vermont, Vision Packs Focaccia Crisps and Pure Flats Cashew Date crackers. Also included in this scrumptious basket is; Sonoma Jacks Cheese, Tavolare Savory Snack mix, Nature's Joy California Pistachios, Jack Daniel's flavored Toffee Pecans, Funkychunky's Sea Salt Popcorn, Snacktales buttery pretzels, Janis & Melanie's Lemon Straws, Dolcetto Wafer Cookies, Mississippi Cheese Straws Company's, Three Cheese Straws and Sea Salt Toffee Cookies, Kettle Kitchen's Toffee Pretzels, Almond Rocca, Godiva's Milk Chocolate Covered Pretzels, Dark Chocolate Covered Almonds, Raspberry Truffle Bar and a Large Chocolate Hazelnut Bar, Wolfgang Puck's Coffee, Key Lime Buds hard candies, Cranberry Dried Fruit Medley, Walkers Shortbread Cookies, Mediterranean Olives, Licorice Petites, Be-Bop Biscotti, Dominion Peanut Brittle, Petite Fruits, Old Fashioned Cream Puff Cookies, Classique Truffles and a Theo's Organic Chocolate Bar. Kettle Kitchen's Toffee Pretzels, Almond Rocca, Godiva's Milk Chocolate Covered Pretzels and more!